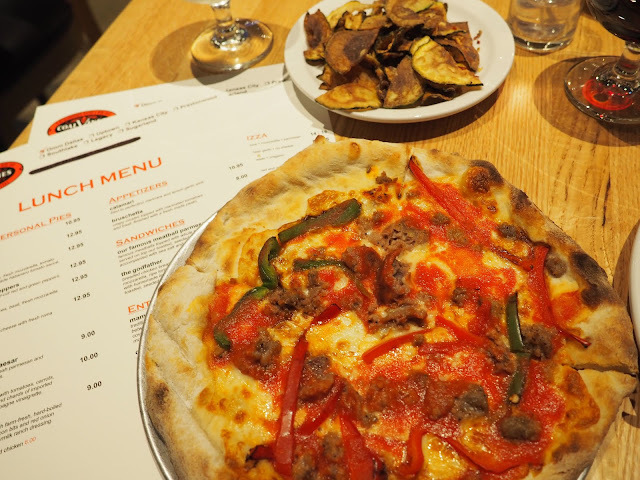 Coal Vines pizza and wine bar is well known for their signature New York-style pizzas, salads, pastas, entree specials, and desserts - not to mention their extensive selection of wines by the bottle or glass. And for all the wine lovers out there, you may be interested to know that they have wine on draft! They have also been recognized as the "Best Pizza in Dallas," and after last night, I think we can stand behind that title. Today, Coal Vines officially rolls out their new "Pizza of the Month" series! Lucky for us, we were able to get a preview of March's pizza - the Roasted Chicken and Baby Spinach Pie - so we could bring y'all the inside scoop before heading over to either the Uptown or Downtown locations. 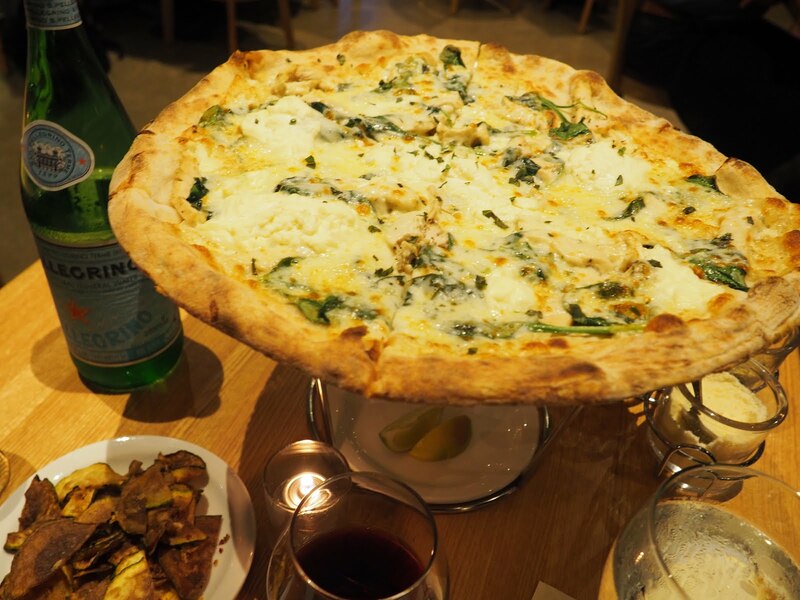 This featured pie is a play on their classic white pizza with three types of cheese - mozzarella, parmesan, and ricotta. The only difference is, they've added a little more texture with the chicken and spinach. All month long, you can pair the 14" pie with a glass of the Malbec or Pinot Grigio, both for just $25! Also try the mozzarella sticks as a starter. 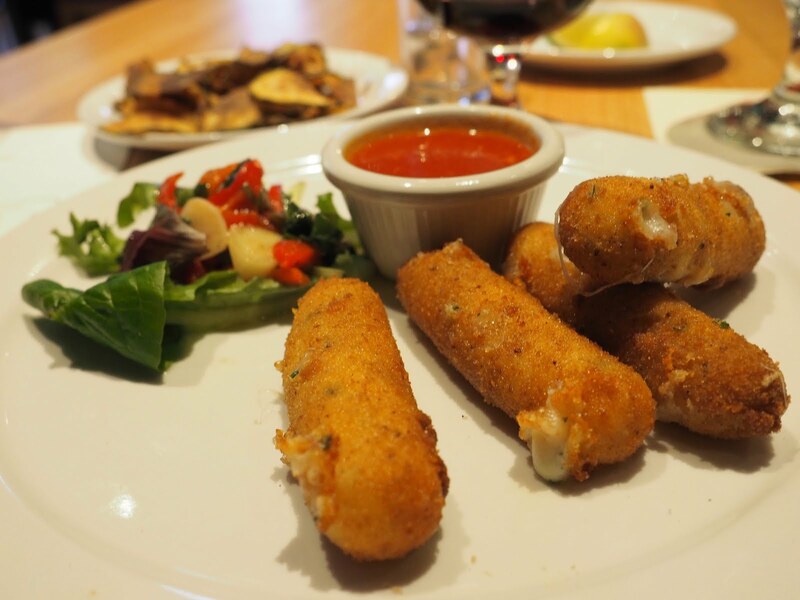 They are no ordinary mozzarella stick... there is rolled prosciutto inside! Did you know that the Coal Vines in Downtown recently introduced a new lunch menu? Other locations in the DFW metroplex will soon follow, but it is interesting to see this fast-paced dining concept coming to this pizzeria. So if you're craving pizza for lunch, you can go during your break and not eat away work time! They'll get you in and out in about 30 minutes! Don't forget to check back in April for next month's pizza and wine pairing special!